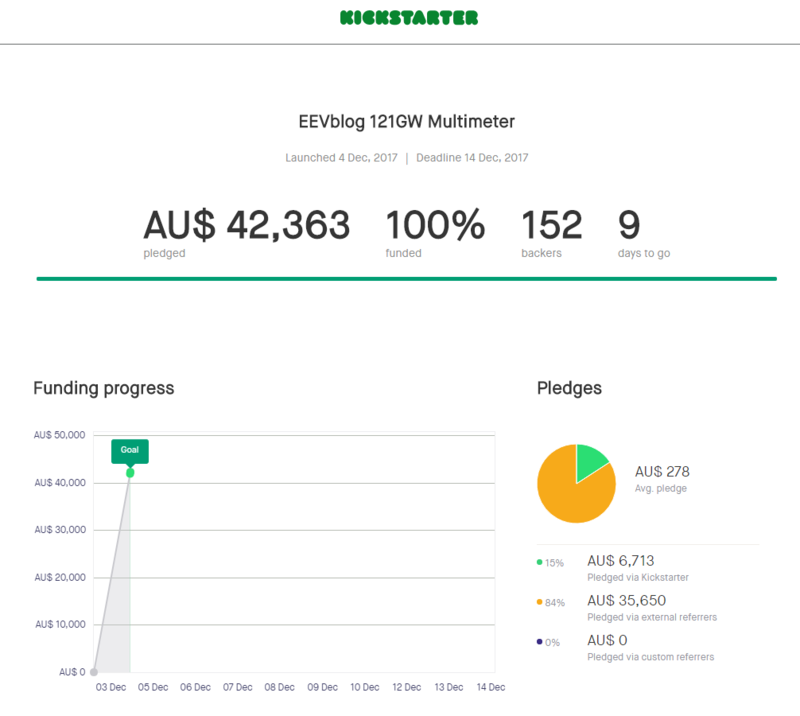 The 121GW Multimeter is now available on Kickstarter! I backed the early bird first production model, but I'm wondering if it would be better to wait until the second batch. EDIT: One year warranty, she'll be right! Ordered. Hope USPS won't lose my package again. Any options getting hold of one any other way? Dave, congrats on the goal being met so fast! Any info on what accessories come with the meter? Looked through the manual and while a few are pictured, I don't see a 'what's in the box' section or anything. I do not own a credit card nor will I in the future. How can you pay for things without a credit card? Credit cards offer much more security for the purchaser than other payment methods. Just backed. I see in the manual there is a note that there is an optional accessory of a magnetic hanger. Do you know what the pricing would be on that? Is it possible that would be a stretch goal to be included? edit: updated the url to point directly to the card. Don't know other countries, but in China and US and Japan and Korea (countries I've been to), a debit card can be swiped just as a credit card, just sometimes with password requirement. For the first 3 years in US I didn't have a credit card, and I have absolutely no problems with a debit card. I don't have a credit card in China till this day, and no problems at all! It might be a good idea to link directly to Dave2's Android app on the Play Store when it's published. There's already a "121GW" multimeter app on there, so it would be useful to distinguish between official and 3rd party versions. Unlike in the U.S. credit cards are not a thing here in Germany. I pay cash or with my banking card (debit card) in the real world and for online purchases it is either debit card, bank transfer as advance payment or Paypal // Amazon payments. Man I gotta have my credit card! Speaking of which, I just got my new one in the mail. The newest VISA ones are different now. The chip is there yes ... but the old embossed numbers are totally gone now on the front. NO numbers on the front at all. They are laser etched on the back. It already broke the Wal Mat Scan & Go app, because it says to scan the front of the card to input your new card ... LOL. I called Wal Mart and told them to get with the program! US debit cards can be used as credit cards. Is yours a Visa/Master/whatever, or it is issued just by your bank without a credit card company? From this site: https://www.deutscheskonto.org/en/credit-card/ Seems like prepaid credit card would be your best bet unless you bank can offer you a visa or mastercard. This thing sells really well... When I put my order there were only $28k pledged, and now it's been $68k. $40k (160 units) sold in 55 minutes, or 3 per minute! Last week only I have ordered an Agilent U1252a, but with VA measurement and built in uCurrent cant resist on this one. Congrats @Dave for successful quick funding. btw is there a datasheet available? Damn, this thing selling like hot cakes, looks like you've underestimated yourself. FYI, Dave is livestreaming on Kickstarter right now. Unlike in the U.S. credit cards are not a thing here in Germany. I understand that might have been the case in the past, but it is now 2017! In the UK where I am from, the law makes credit card issuers jointly responsible with the seller for anything bought with a credit card. So if anything goes wrong and you cannot reclaim the money from the seller, you can reclaim the whole amount from the card issuer. Therefore it is foolish not to use a credit card for purchases. The law may not give you that protection in Germany (I don't know), but you can certainly get a credit card in Germany, and you will find it very difficult to travel internationally without one. Shoutout to Dave2 for developing a very nice looking app.